BAHRI IS ONE OF THE WORLD’S FOREMOST TRANSPORTATION AND LOGISTICS COMPANIES. Established as the national shipping carrier of Saudi Arabia, Bahri has played a leading role in the transformation and growth of the global shipping industry through an unrelenting focus on innovation and a commitment to delivering technology-driven, value-added onshore and offshore services. In the four decades since its inception, Bahri has grown from a small shipping firm operating multipurpose vessels to become one of the biggest transportation conglomerates in the world and occupies a preeminent position in the global maritime industry today. Bahri – formerly known as (NSCSA)– was created by a Royal Decree as a public company in 1978, with 22% ownership stake held by the Public Investment Fund (PIF) of the Saudi government, 20% by Saudi Aramco Development Company (SADCO), and the remaining shares listed on the Saudi stock exchange (Tadawul). The first and currently one of six business units within Bahri, Bahri Logistics is one of the top 10 breakbulk carriers in the world. Bahri Logistics operates 6 new state-of-the-art multipurpose vessels with 26,000 DWT each on a regular liner schedule; 4 vessels connect the Canada & the United States to Saudi Arabia and major ports in the Gulf, Indian Subcontinent and the Mediterranean, and 2 vessels connect Europe to Saudi Arabia and key ports in the Gulf and the Mediterranean. Bahri is the first national shipping carrier to complete more than 38 years of operations, and the company continues to stride forward triumphantly, having built a strong customer base in KSA and beyond and a peerless reputation for quality, reliability and safety. Through its commitment to innovation and to applying best practices across all areas of business, Bahri has been able to stay on the leading edge of the maritime industry throughout its operational history, while diversifying its business domain and expanding into new markets to consolidate its credentials as a global transportation and logistics powerhouse. Bahri has become one of the world’s largest Ro-Ro operators offering Liner services linking the Middle East with North America, the Far East and Europe. 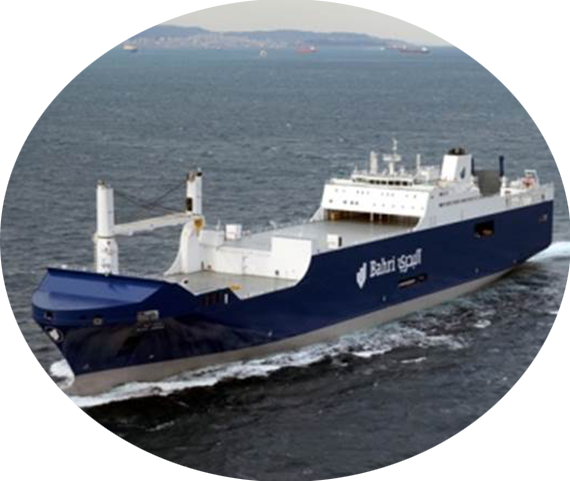 Bahri operates multipurpose vessels on a monthly schedule handling Breakbulk, Ro/Ro, Projects as well as Containers. Main ports of call in N. America are Baltimore, Houston, Savannah, Wilmington and Saint John, NB.